Homemade Strawberry Kiwi Juice made from scratch. This is a healthy breakfast beverage favorite at home. Make this fresh juice within 3 minutes easily and start out your morning well. I absolutely adore this fruit juice with strawberries and kiwis in the morning. Not just because the juice tastes great but because kiwi and strawberries pack a lot of health benefiting antioxidants. Sometimes I even make some extra to enjoy after work out in the evening. Besides, it’s so easy to prepare this juice from scratch because strawberries and kiwis are hassle free. I initially came upon this juice in the Paris Aeroville shopping mall (while admiring the fossil bag line) and totally fell in love with the combination of strawberries and kiwis. 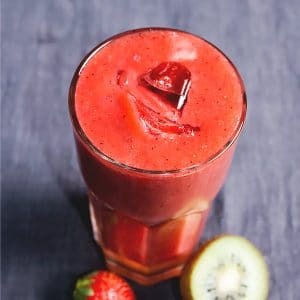 How to make Strawberry Kiwi Juice? 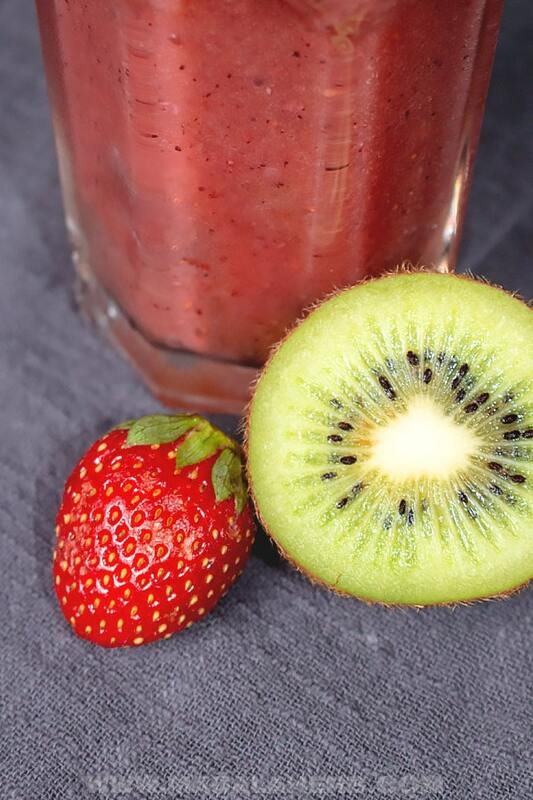 To prepare this kiwi strawberry juice recipe you can use your vitamix blender. This juice doesn’t require a juicer (yay!). Use fresh quality fruits for the best and most flavorful homemade strawberry juice with kiwi. Wash your fruits. Cut off the strawberry stem and peel the kiwi. Place the fruits into the blender jar with the desired amount of cold water. The more water you add the more liquid your juice will turn out. Pour the juice into a glass with ice cubes. 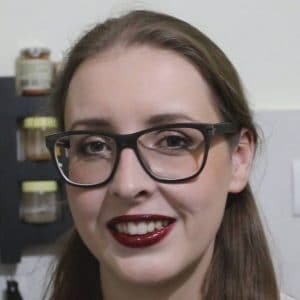 I don’t strain the juice with a fine sieve because I don’t think it’s necessary. 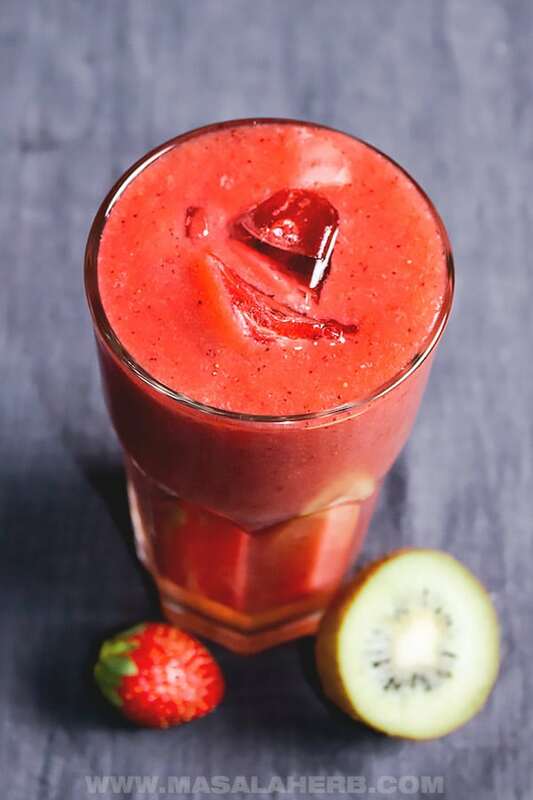 The little kiwi and strawberry seeds actually add a lovely texture to your strawberry kiwi juice recipe. How to store the strawberry kiwi juice? 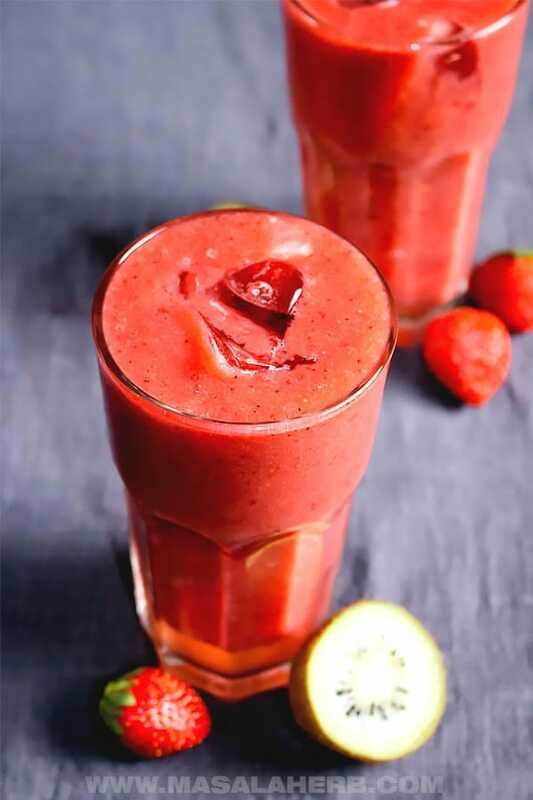 You can prepare this mixed fruit juice with strawberries and kiwis in advance and store the juice in the fridge. Keep in mind that the fruit pulp will separate from the added water if not consumed instantly. In that case, just mix it all up again with a spoon. Or don’t add water and store the blended fruit pulp in the fridge or freezer for over a longer period of time. That way you just need to take it out and mix with some water to thin it out if you like. 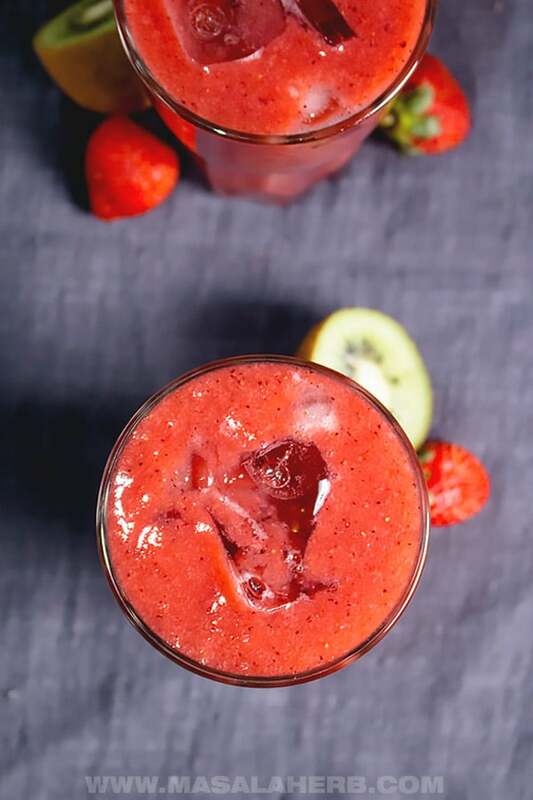 Fresh Strawberries and Kiwis turned into a velvety bright juice. I love this juice for breakfast or after a workout, it helps me to revitalize instantly. Wash your fresh fruits. Cut off strawberry stems and peel the kiwi fruits. Place the fresh fruits into a blender jar. You can cut the kiwi into quarters if you don’t have a powerful blender. I recommend the Vitamix blender for the smoothest juice in the world. Add water to the blender jar and blend everything smoothly. Pour the juice into servings glasses and enjoy with ice cubes asap. Use fresh fruits if possible but you can try to use frozen strawberries too if strawberries and kiwi are not in season. You can add more or less water. It depends on how you like your juice, more liquid or thick. You can store the juice in the fridge but mix it up again if the pulp separates from the water. Dear Reader, how often do you prepare fresh fruit juices at home? Hi, this may be interesting you: Strawberry Kiwi Juice!